Pause now and take a good look at yourself and see who you really are. Do you know? Do you think of yourself as being a wretched weakling? Do you pretend to be someone you are not? Then imagine this: that you would dare to think you are worthy of being called by our Lord to a special task. The desire to be God’s servant must come from your own will, a gift placed there by the hand of God Almighty, but done so only with your consent. The hardest task for anyone is to see yourself as others see you. We have a rosy vision of our looks, behavior and personality. Many times our self-assessment is far from the truth. In order to approach God we must realize our helplessness without Him and allow Him to give us His grace. Jesus said: “Jerusalem, Jerusalem, the city that kills the prophets and stones those who are sent to it! How often have I desired to gather your children together as a hen gathers her brood under her wings, and you were not willing?” Their behavior blatantly showed there lack of self-understanding. Do you have a false self? Can you see that God values you? “For God so loved the world that he gave his only Son, so that everyone who believes in him may not perish but may have eternal life.” He gave His son! What more proof can we expect! God values us enough to sacrifice His all for us. We are unworthy/worthy creation. When we come to the point of recognizing our value to God, we are ready to move toward God. 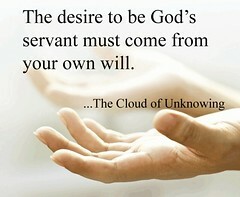 Do you understand how to give yourself to God? The easy answer to this question is to say we must be “saved/born again.” Personal salvation is an important doctrine of scripture but it is only the beginning of our Christian walk. If we give ourselves to God just one time, we miss the point. I once heard a man say in a bit of a mocking way, “I was born again and again and again.” I would assert that is exactly what giving yourself to God truly encompasses. We must rise every day to a new round of willing prayer and submission to God. Salvation is not a one-time event. I am not sure it is an event at all, but I know it is a journey. Let us join together and set out daily on this contemplative path. Lord allow me to see my sin and weakness. Give me the courage to not hide behind a façade of spirituality. Allow me the insight to know that you love me in site of myself. With these things in mind propel me more forward in the grace journey towards You.